California’s BAD GIRL Punk Band – The RUNAWAYS ! So Let’s Check Them OUT For Reals…. The Story of the RUNAWAYS…California’s First & Fastest All-Girl Punk Band…ROCK ON LADIES…!!! The Runaways from left to right: Sandy West, Jackie Fox, Cherrie Currie, Lita Ford, Joan Jett. Us Boys Were Stoked..! We’d been Listening to the Laid-Back Eagles, or to Get our Ya-Ya’s – The Stones & Even Stonier Led Zeppelin. But Bald-Headed Ian Anderson & Jethro Tull was a Burnout. Guys like Mick & Rod ‘The Mod’ Stewart & The Faces were getting all The Babes Like Bianca & Britt Ekland. There wasn’t even Really L.A. Radio to Deal with Punk Rockers yet, in 1975. PowerHouse KMET, A GREAT L.A. Radio Station – Played Power Rock like Ted Nugent & Deep Purple & Glam Boys Bowie & T.Rex and then All the Girls went Ga-Ga Glam on Us. The Precursors to Punk.. 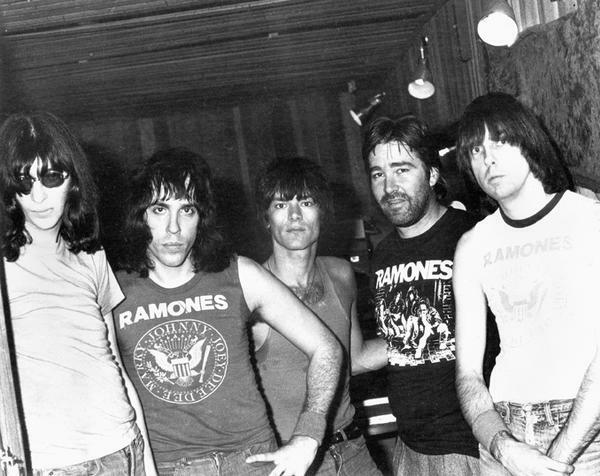 The Ramones Hadn’t Hit California Yet…They were in New York with David Johansen & the New York Dolls & Iggy Pop. 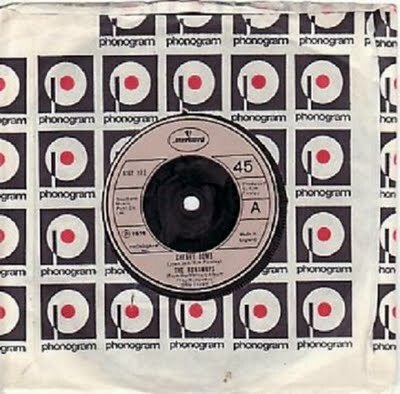 THEN We Heard Some Screaming Rocking GIRLS on the Airwaves- THE RUNAWAYS…AND they Were HOT..!! Their First Big Hit was CHERRY BOMB…So, Well..Yeah !! HOT GIRL ROCKERS…Rocking it in Lingerie & Heels & Shag Haircuts, Leather & Plum Lipstick…Thank You God…Finally !! The Runaways were formed in late 1975 by drummer Sandy West and rhythm guitarist Joan Jett. They had introduced themselves (on separate occasions) to producer Kim Fowley stating their ideas to form an all-girl band. Fowley, who was always looking for the next big thing, gave Jett’s phone number to West. The two met on their own to discuss the possibilities. After rehearsing together, the pair contacted Fowley to let him hear the results. Fowley then helped the girls find the other members. Although Fowley would continue to take credit in the press for creating the band and the music, he would later admit, “I didn’t put The Runaways together, I had an idea, they had ideas, we all met, there was combustion and out of five different versions of that group came the five girls who were the ones that people liked”. Starting as a power trio with bassist Micki Steele, The Runaways began the party and club circuit around Los Angeles. In 1976, they added 16-year-old lead guitarist Lita Ford and lead singer Cherie Currie to the lineup. Bassist Micki Steele left the group, later resurfacing in The Bangles. An unknown local bassist named Peggy Foster took over on bass but also left after only a few weeks. Kim Fowley then brought Ann Boleyn, who later went on to perform with Hellion and Detente, as the bass player. Finally, Jackie Fox (who had originally auditioned for the lead guitar spot) was added on bass, and the line up was complete. 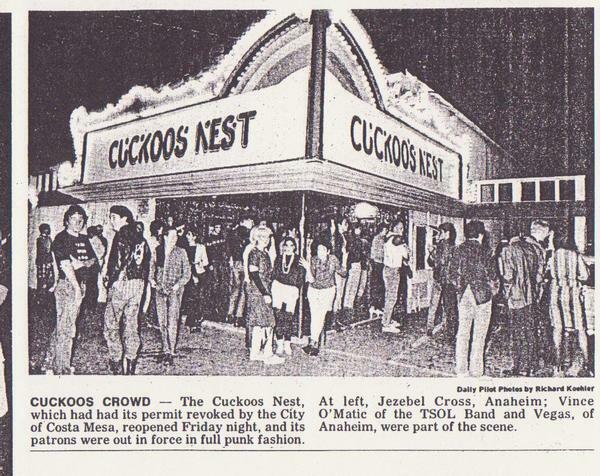 There were often confrontations with the punks from the Cuckoos Nest and the cowboys from Zubies, which shared a parking lot. The police were constantly harassing the punks. Club owner Jerry Roach fought a number of court cases in an effort to keep the club alive, and in his 1981 film on the subject Urban Struggle he suggested that perhaps this was the first time that the authorities would stamp out a fad. The club was a hub of the punk rock in California. The club is notable as being home to the first slam pit. Bands such as 999, The Ramones, The Damned, the New York Dolls, Black Flag (band), TSOL, Circle Jerks, D.I., and Social Distortion all played gigs there. The club was memorialized in the Vandals song “Pat Brown,” a song about a clubgoer who actually tried to run the cops into the ground. Runaways-1978 Looking & Sounding HOT ! In the summer of 1977 the group arrived in Japan for a string of sold out shows. 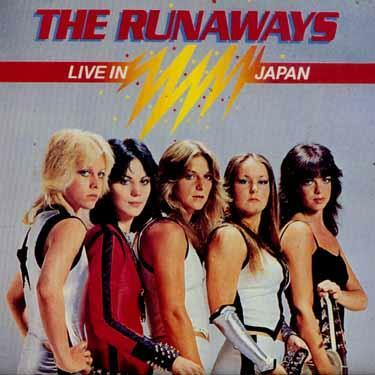 The Runaways were the number 4 imported music act in Japan at the time, behind only Led Zeppelin, ABBA, and Kiss in terms of album sales and popularity. The girls were unprepared for the onslaught of fans that greeted them at the airport. 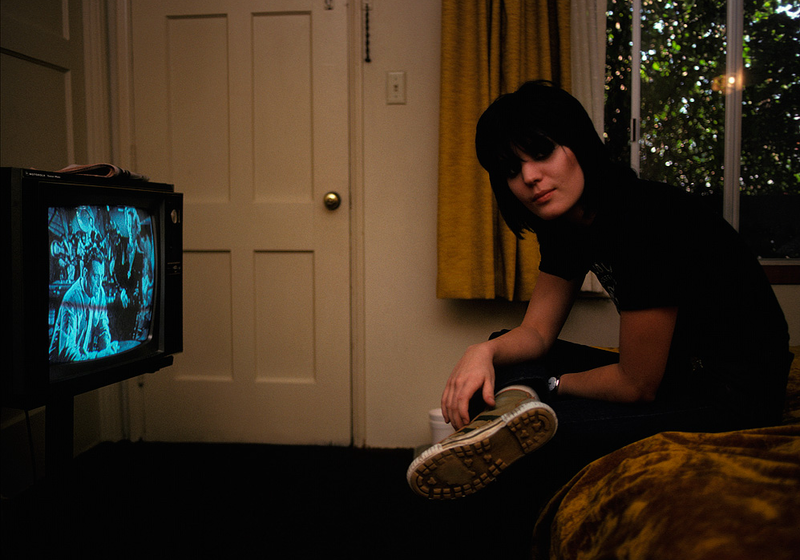 The mass hysteria was later described by guitarist Jett as being “like Beatlemania“. While in Japan, The Runaways had their own TV special, did numerous television appearances and released a live album that went gold. While in Japan, bassist Jackie Fox left the band shortly before the group was scheduled to appear at the 1977 Tokyo Music Festival. Jett temporarily took over bass duties and when the group returned home they replaced Fox with 17 year old Vicki Blue. Singer Cherie Currie then left the group and Jett, who previously shared vocals with Currie, took over lead vocals full time. The band released their 4th album,Waiting For The Night and started a world tour with their friends The Ramones. Currie released a solo LP Beauty’s Only Skin Deep, produced by Kim Fowley, and began a separate U.S. tour, which included her identical twin sister Marie. 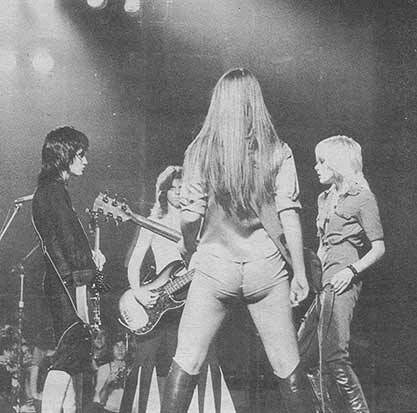 Due to disagreements over money and the management of the band, The Runaways and Kim Fowley parted ways in 1978. The group quickly hired new management, who also worked for Blondie and Suzi Quatro. When the group split with Fowley, they also parted with their record label Mercury/Polygram, to which their deal was tied. In the Edgeplay documentary, members of the group (especially Fox and Currie) as well as the parents of Currie and West, have accused Fowley and others assigned to look after the band of using divide and conquer tactics to keep control of the band, as well as verbal and sexual abuse of the band members. Bassist Vicki Blue left the group and was replaced by Laurie McAllister. The band reportedly spent much time enjoying the excesses of the rock n’ roll lifestyle during this time. They partnered with Thin Lizzy producer John Alcock, (after Jett’s future partner Kenny Laguna turned down the job) to record their last album And Now … The Runaways. The band played their last concert on New Year’s Eve Day of 1978 and broke up in April 1979. The First True California QUEENS OF NOISE ! Come & Get it Boys !